Jeremy Corbyn, Leader of the Labour Party, May 12, 2017. Photo by Chatham House, London/Wikimedia Commons. 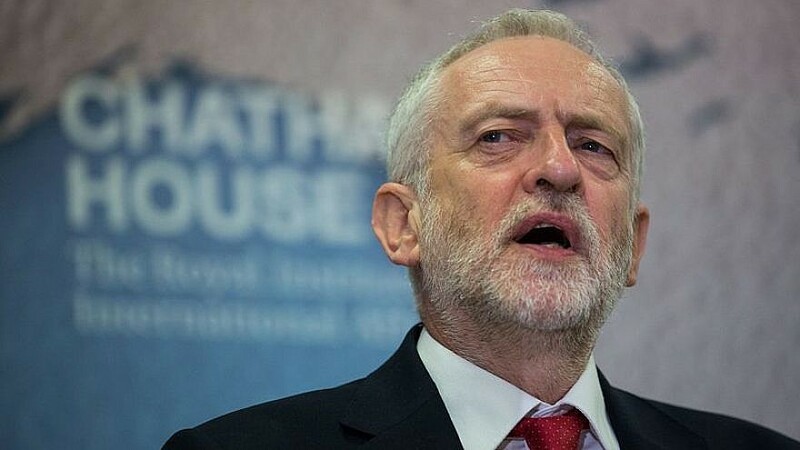 The declaration by Christians United For Israel comes amid three Jewish newspapers in the U.K. accusing Labour Party leader Jeremy Corbyn of being an “existential threat” to British Jewry. (August 10, 2018 / JNS) Thousands of Christians have voiced solidarity with British Jewry amid ongoing allegations of anti-Semitism by Labour Party leader Jeremy Corbyn. The U.K. branch of Christians United for Israel (CUFI) launched a “Christians Against Anti-Semitism Declaration” last week to provide Christians with a chance to pledge to lead by example in calling “for tougher action against anti-Semitism and addresses the current crisis within the Labour Party,” according to the organization. The declaration has been signed by almost 5500 people as of Aug. 10. The declaration by CUFI comes amid three Jewish newspapers in the U.K. accusing Jeremy Corbyn of being an “existential threat” to British Jewry. The declaration condemns anti-Semitism “in the strongest possible terms,” stands “with the Jewish people in the fight against anti-Semitism,” and sides with the International Holocaust Remembrance Alliance (IHRA) definition of anti-Semitism, which has been adopted by Parliament and over 130 local councils, and endorsed by the Jewish community. “Archbishop Justin Welby has affirmed to us his personal commitment to countering anti-Semitism, but as yet the organization has not adopted the IHRA definition themselves,” Starritt added. That move was coldly received by the Jewish community, including 68 rabbis from multiple denominations in signing an open letter, calling on Labour to accept the IHRA definition entirely. “Had the full IHRA definition with examples relating to Israel been approved, hundreds, if not thousands, of Labour and Momentum members would need to be expelled,” read the editorial from the Jewish News, Jewish Chronicle and Jewish Telegraph – Great Britain’s leading Jewish newspapers. “With the government in Brexit disarray, there is a clear and present danger that a man with a default blindness to the Jewish community’s fears, a man who has a problem seeing that hateful rhetoric aimed at Israel can easily step into anti-Semitism, could be our next prime minister,” the editorial added. “There is also argument that Jeremy Corbyn is refusing to adopt the full definition with all its examples because Corbyn himself would be judged against these examples and labelled anti-Semitic based on his past statements,” Starritt added. The concern over Corbyn stems from his refusal to condemn anti-Semitism and his sympathy toward Israel’s enemies, including Hamas and Hezbollah. Corbyn’s appeal was slammed by British Jewry, including the Board of Deputies of British Jews, which accused the party leader of publishing his “ill-timed and ill-conceived” message just before sundown on Friday, which commences the Jewish Sabbath and its prohibition of using electronics, preventing Orthodox Jews from responding until after the Sabbath’s 25 hours. Anti-Semitism Labour Party leader Jeremy Corbyn.